New York’s Gov. Andrew Cuomo announced earlier this month that he would set a $15 minimum wage for all state workers on his own and without legislative action. Cuomo’s move will give raises to about 10,000 state workers, adding $20.3 million annually to state spending by the time the increase is fully phased in. What the heck. No skin off his nose. The state doesn’t have to make a profit. Take it out of taxpayers’ pockets. That seems to be the attitude of a lot of folks these days. Wages have been stagnant for years for most people and inequality is the topic de jour. Let’s give a whole bunch of people a raise. But whatever people say to pollsters about their support for higher minimum wages, that doesn’t necessarily translate into a willingness to pay the higher prices for goods and services that often result. Furthermore, a sweeping across-the-board $15 an hour mandate that might be bearable for a business in Portland also might be devastating for a small business in Astoria, Echo or Pendleton. The problem is that the minimum wage was never intended to be enough to support a family and that even a $15 minimum wage would still be a long way from achieving that goal. In Oregon, for example, a family of four needs to earn about $64,000 for a reasonably comfortable living. A $15 an hour wage in a full-time 40-hr week would translate into an annual income of just $31,200. It’s not even clear that raising the minimum hourly wage to $15 would be a clear victory for all the poor. It would certainly raise the wages of many workers, but it would also likely lead to the elimination of many jobs traditionally open to unskilled minimum-wage earners. In addition, most of the benefits of an increase to $15 an hour would not go to people actually living in poverty. In fact, about 50 percent of current minimum-wage workers are under 25, and about 25 percent are teenagers. The unemployment rates of both groups are already higher than the 5 percent national unemployment rate. People without a job are much more likely to be living in poverty than those who are employed. Furthermore, many of those earning less than $15 an hour today are not the primary breadwinners in families. That being the case, a better way to address poverty would be to work harder to position the unemployed for the workforce and to target income supplements on low-income families through such programs as the Earned Income Tax Credit. When I see a plaintive story about Suzie, a fast food worker who protests that she’s been working at the counter for 4 years and hasn’t seen any substantial raises, my first thought isn’t, “Well, double Suzie’s pay, youInstead, I think, “How can you justify a big jump in pay to someone who has been performing the same low-skill job for 4 years, with no increase in her expertise and no increase in her productivity that enhances the company’s bottom line?” That may sound brutal, but it’s how things work at every single successful company. It can’t be otherwise. Supporters of the $15 an hour minimum wage also err when they say it won’t cost much. A $15 an hour minimum wage would not happen in isolation. There would be a cascading effect on other workers, thus a greater cost impact on the employer. If you raise the hourly pay of the McDonald’s crew from $9.25 to $15 an hour, a 62 percent increase, can you leave the shift manager’s pay at $10.20 an hour, and so on up the ladder? At some point a franchise owner will say, “enough!” McDonalds has tested automated self-service kiosks that have been shown to reduce customer wait times and generate higher sales than ordering from workers at the counter asking, “Do you want fries with that?” That may be the future if we go down the $15 road? President Barack Obama announced today his administration’s denial of TransCanada’s permit to build the Keystone XL pipeline. “It became a symbol too often used as a campaign cudgel used by both parties rather than a serious policy matter,” Obama said. He ought to know. It was his administration that turned it into a dollar-driven political football. TransCanada Corp submitted an initial application to build the project to the U.S. State Department on September 19, 2008, 2605 days ago. TransCanada knew the review process might take some time, but expected it to be generally non-controversial and to end with approval. But nothing in ideology-riven Washington, D.C. is fast and simple anymore. Thanks to politics and the shrieking of special interest groups, the project became a pipe dream. It’s been a hard lesson for TransCanada – and an expensive one that illustrates how lobbying and political contributions have become such a growth industry. When TransCanada submitted its application it didn’t even have a full-time lobbyist in Washington, D.C. It took the company almost four years to open a Washington office in June 2012. By that time environmentalist opponents had pounced, raising the issue to political and public prominence. In November 2011, for example, thousands of protestors encircled the White House and demanded that President Obama deny TransCanada’s application. 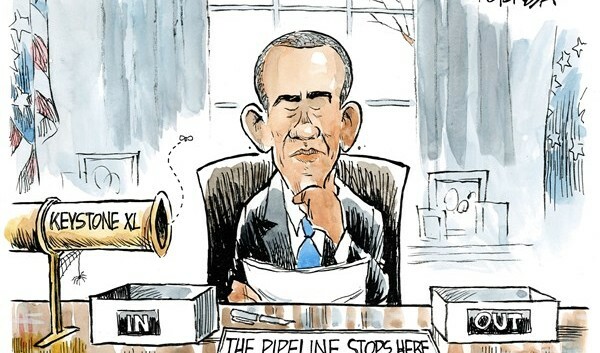 “…in just a few years, the political debate over Keystone has exploded into an entire sector of the Washington influence economy. Funded by multibillion-dollar oil companies, labor unions and ultrarich environmentalists, the fight has filtered into every crack and crevice of the nation’s capital,” Politico reported. The Center for Responsive Politics’ Open Secrets, says 163 clients reported lobbying on specific issues related to the Keystone XL pipeline in filings covering 2006 to the present. Exactly how much was spent by both sides of the acrimonious conflict is unknown, but Politico guessed it was well into the tens of millions of dollars. In 2008, TransCanada reported spending just $190,000 on lobbying, Open Secrets reported.. Since filing its application, TransCanada has spent a total of $7,160,000 just on lobbying. That’s on top of all the political contributions to members of Congress by the oil and gas industry, much of which has been tied to the Keystone pipeline in recent years. According to Open Secrets, that totaled $23,891,355 in the 2010 election cycle, $36,756,574 in the 2012 cycle and $31,381,383 in the 2014 cycle, overwhelmingly to Republicans. Even the Canadian government and the Clinton Foundation have gotten in on the action. In 2014, Canada’s Foreign Affairs, Trade and Development agency, a pipeline advocate, donated $480,000 to the Clinton Foundation in anticipation of Hillary Clinton’s run for the presidency. What a waste. In the end, Obama did what he planned to do all along.